Last weekend I decided to embark on putting the KonMari method to practice. I am still working through the clothes category, but I decided to learn how to feel my “Joy Spark” with dresses since it’s probably my smallest category clothes wise. Admittedly, dresses are my most frivolous purchase. They make me feel beautiful and I like having a new dress to commemorate an extra special occasion. This year I had a wedding to attend, two graduations, and other functions and yes, I let myself buy a new one for each one. 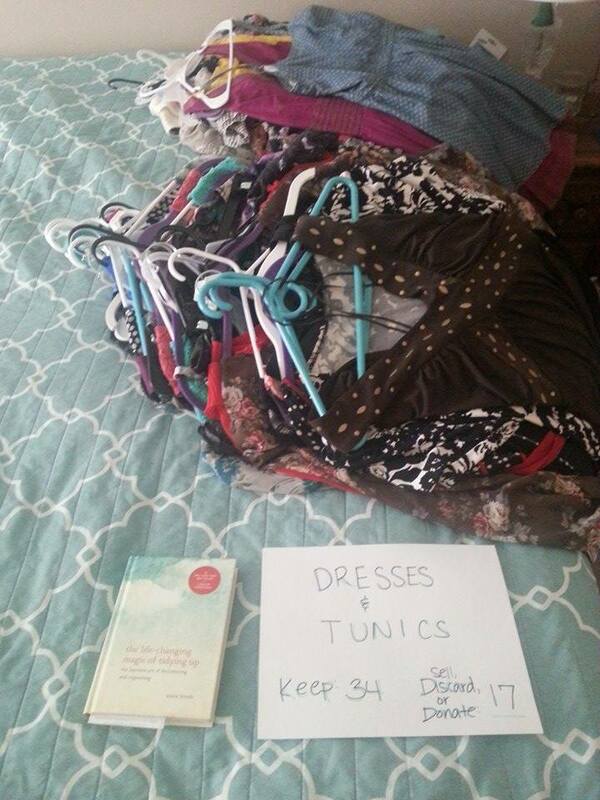 That’s probably how I ended up with 51 dresses total. Which, I’ll admit, is more than I ever needed! I whittled the collection down to 34 which still seems a bit large but does include extra dressy ones and ones I do rotate into my work wear. I don’t currently like how tunics look on my body right now as I’m heavier than when I purchased many of them (some of these items are a decade old) so it was easy to say goodbye to them. Next, I did my bras, underwear, tights, and slips. I’ve always folded my undies as I think they look better that way but I did use a few shoeboxes to keep things compartmentalized and it made a huge difference! I wear a large cup and band size for bras so I think I will be moving my bras out of the drawer where they are being crumpled and jammed and put them in my closet. And then, the madness of shirts and pants and tank tops. Oh my…that took up the rest of my day and I still have pants to work on as I mostly did shirts. 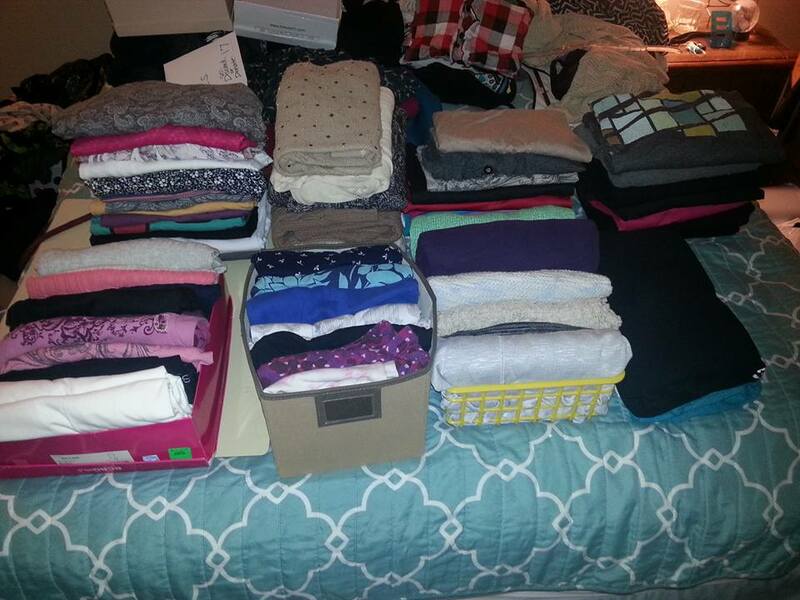 I’ll admit, getting things to stand and folding them KonMari style was more frustrating than I first thought. Because I am plus size, my clothes are wider and longer. This makes larger and longer rectangles that don’t stand as easily. I decided for pants to fold in the crotch area to bring the size down a little and for sweaters, to overlap a bit of shoulder to make them more compact. Despite frustration, the neat looking piles and streamlined look kept me motivated. Remember how I said I’m plus size so my folded clothes are wider? I own a cheapie chest of drawers to begin with so it is not very deep or tall. My solution was to lay the clothes vertically. 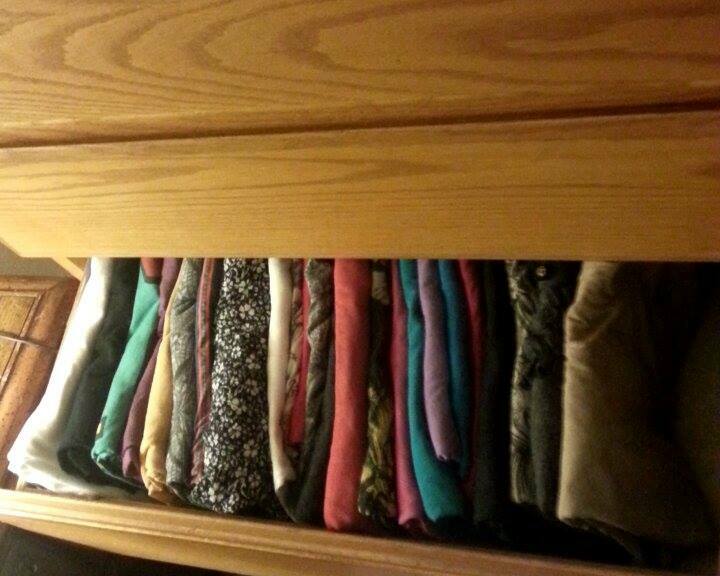 I was able to fit most of my folded tees into one drawer, where before it was a few drawers and then some. This was the most rewarding part of my day. I’m making progress! There’s much more to do this weekend. I also have a good amount of clothes to launder so I’m getting that out of the way so I’ll be ready to tackle part two. From mostly tops alone, I filled two trash bags to donate. The dresses I plan to sell or give to someone (truly) in need of some.